Attend a Path to Membership session, which we offer once or twice a year (more below). Call the church office at 718 447 2204 for an appointment with Minister Emily DeTar Birt. Email the Membership Committee here with your phone number, and request we contact you. You may want to attend one of our Path To Membership sessions. They are held once or twice a year. It's an excellent way to learn more about Unitarian Universalism, and about the Unitarian Church of Staten Island and its members. Path to Membership sessions allow members and non-members to get to know each other better and explore the meaning of membership in the Unitarian Universalism Church of Staten Island. They allow us to explore our various spiritual journeys and to share what moves members about the Unitarian Church of Staten Island. You will gain a deeper understanding of Unitarian Universalist theology, increase your knowledge of American Unitarian and Universalist history, get an in-depth look at our own Church's history and the history of our building, as well as an understanding of the church's committee structure and programs. If you have questions regarding membership and would prefer not to wait until a class is held, Membership co-chairs Maureen Curran and Sarah Dolinar are available to answer your questions. Simply email them, or approach anyone sitting at our Welcome Table in Fellowship Hall, during coffee hour, after Sunday morning service. HAVE YOU DECIDED TO BECOME A MEMBER? GREAT! If you are ready to become a member, please contact Rev. DeTar Birt or one of our Membership Committee members during Sunday coffee hour in Fellowship Hall. They can arrange for you to sign the membership book! If you are ready to become a member speak with Rev. DeTar Birt or with one of our Membership Committee members during Sunday coffee hour in Fellowship Hall. They will set up a time for you to sign “The Book” and join our Unitarian Universalist family. After you sign the book, you will be asked to sign your first pledge card—an important part of the membership journey! Making a fiscal commitment to the congregation will engage you in stewardship of the church. UCSI pays dues to the Unitarian Universalist Association and the Northern New England District for each member in our congregation. Collectively, members' pledges help pay the church staff, maintain and repair the church grounds and facilities, support Religious Exploration, and our social justice and community outreach efforts. Soon, you will be able to submit your pledge electronically, on this site. Until online pledging is instituted on this site, you can download a PDF of the Pledge Form here, and return it via email, "snail mail" or in person. Membership pledge cards are also available on request, before or after Sunday service. Fill out a pledge form and hand it to one of our greeters or ushers, or hand it to one of the people wearing a name tag during coffee hour in Fellowship Hall. 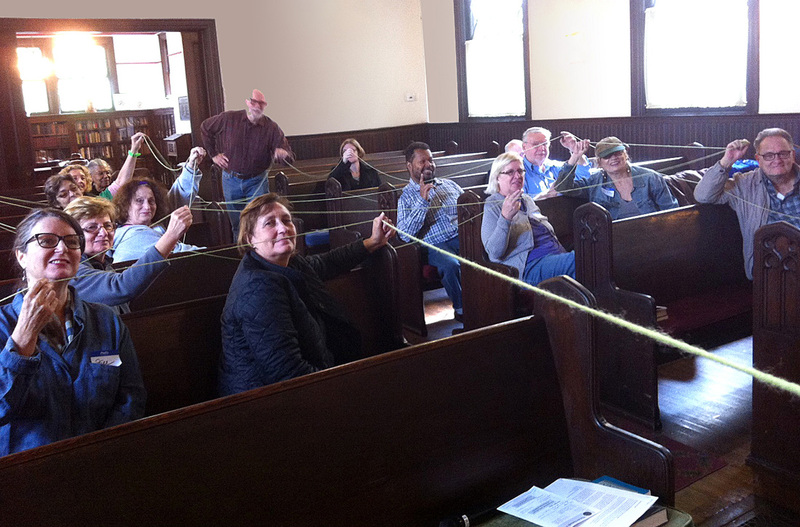 The interconnectedness of membership is demonstrated with some yarn, during one of our member-led services. Your vote shapes the character and future of this community. Every 2 months receive this beautiful, inspiring Unitarian Universalist Association publication. Child Dedications, Weddings and Memorial Services at no cost to members. Rates for Religious Exploration (RE—Sunday School) tuition, hall rental and the Memorial Garden are significantly lower for members. Worship services, programs and potlucks are not the same without you. Join in and help make UCSI happen. We are an active congregation made possible by the time and talents of our members. Contact a committee, the Minister or a Board member and offer your volunteer service. Participate in classes and small groups to share your search for truth. Teach, sing, lead worship, work for Social Justice. Support UCSI financially. Over three quarters of our operating income comes from member pledges. Phone 718 447 2204, or email membership@uucsi.org.